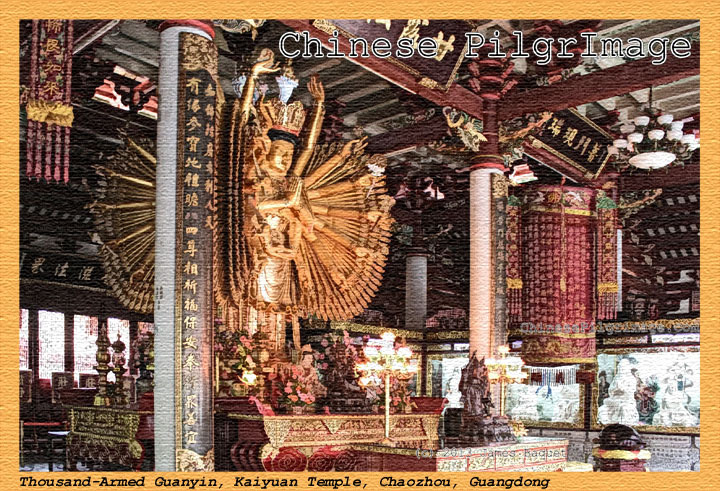 Guangdong (广东, 潮州市), is the centerpiece of a hall filled with Guanyin (观音) images. From Shantou, on the very cold day before Chinese New Year I took a day trip up to beautiful Chaozhou to visit the largest Buddhist temple in the city. 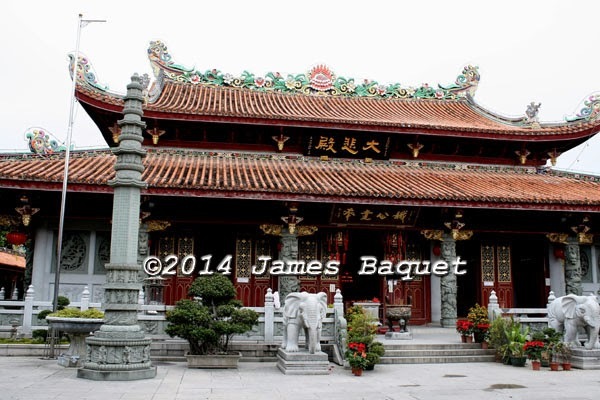 Kaiyuan Temple was built in the Tang Dynasty in 738 C.E. Although sources say that most of the current buildings date back 200 years or so, there was construction going on when I was there, and I suspect that soon most of the buildings will be brand new. In fact, the most interesting thing I saw there is indeed new. The huge Hall of Great Compassion stands in a courtyard of its own to the east of the main compound. 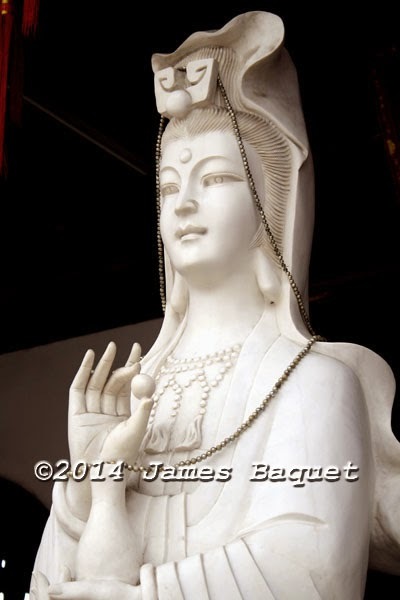 It's filled with marvelous images of Guanyin, the Bodhisattva of Compassion. One of these is a huge gilt central figure with a thousand arms, and faces on four sides. The others are of a white carved stone. 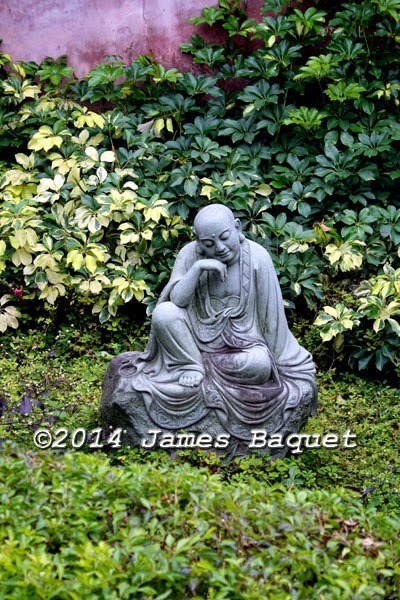 Outside the hall is a garden containing beautifully-done figures of the Eighteen Arhats, disciples of the Buddha. While they're often seen inside the main halls of temples, it's unusual--and wonderful--to see them amongst foliage. Also in the same compound, a very modern-looking figure of Guanyin carved from white stone stands in front of a gateway. And the exterior of the hall has bas-reliefs depicting scenes from the life of Guanyin. Elsewhere on the grounds were numerous halls, a small one of which, in the back, contains a statue of Bodhidharma, the first patriarch of Chan (Zen) in China, with other figures on either side of the room. I left just in time to catch a bus back to Shantou before everything shut down for New Year's Eve. 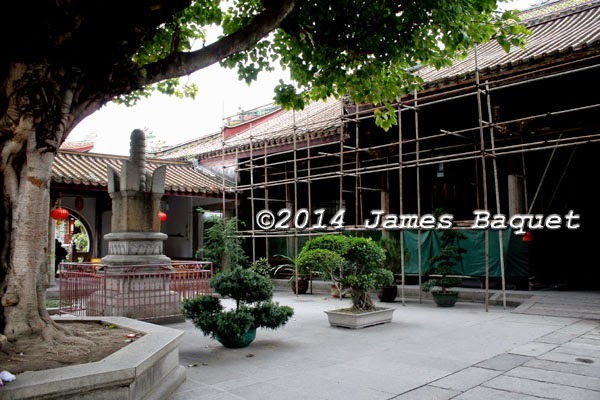 The Heavenly Kings' Hall at Kaiyuan Temple was being refurbished. 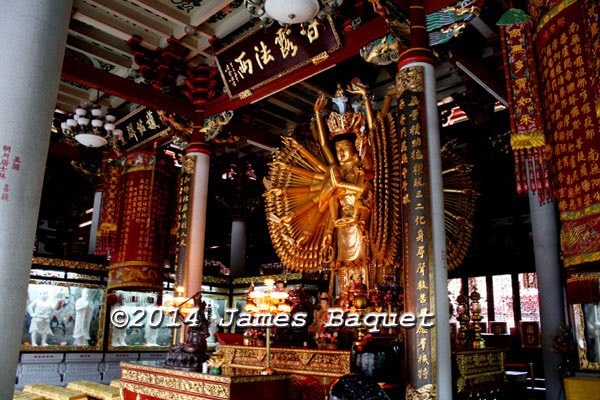 This modern-looking statue of Guanyin stands before the Hall of Great Compassion. There are 21 pictures related to this temple (some of them identical to these, but with different captions) in a FaceBook album starting here (available to all, even without a FaceBook account).